Building A Retaining Wall? Here's What You Need To Know! Retaining walls are incredibly important when it comes to controlling erosion or decreasing the dangers of a steep slope but they can also be used as a decorative structure to highlight or define your garden areas. They have become increasingly popular over the past few years and not only add to the beauty of your outdoor space but increase the value of the property itself. To build a successfully constructed and well-designed retaining wall, there are several factors you need to keep in mind. 1. When designing your wall, you want to make sure that it will be incorporated into your lifestyle. Retaining walls are now being used to create multi-level garden areas or multi-use outdoor spaces. You want to make sure that your retaining wall enhances not only your outdoor space but your lifestyle as well. 2. Get creative with the design of your retaining wall; it’s important to remember that when it comes to transforming your landscape, the possibilities are as endless as your imagination. A retaining wall with a curve is more interesting than a straight line. A garden hose or a large rope can be used to help you layout your retaining wall design – then use a shovel to mark it out. 3. Size definitely matters when building a retaining wall. Walls that are 4 feet and under in height can be easily designed and built without thinking too much about structure. For larger walls, structure is important because you don’t want it to collapse; you will also need to check your local building regulations as permits might be required for the construction of a wall more than 4 feet in height. 4. Plan for drainage; a wall that has a slope dropping towards it will need added drainage at its base. To allow for drainage you can install a fabric-covered drainage pipe and some gravel at the base (the fabric will keep the pipe from becoming clogged). 5. If you are building your retaining wall up a steep slope from a lower grade you will need to gradually step up the retaining wall to achieve a greater slope. Think about terracing, you essentially want to turn your one steep slope into several more level areas slightly resembling a staircase. This will allow you to be able to maneuver the slope safely and the newly created level areas can then be used for planting. 6. Keeping your wall and the surrounding area level is incredibly important as it will ensure that your wall is not only well balanced but sturdy as well. Before building your wall make sure to level out the space and as you continue to build the wall be sure to check that each block is level – this will also give your wall a consistent look. 7. Creating a solid base is key because this will set the tone for your entire project. When creating the base you want to dig out a trench several inches below grade and tamp it (compact it) to ensure that it is level. Then you add gravel and tamp it as well before constructing your first row. 8. Backfilling your wall provides support for your structure. When you complete a row of blocks, backfill with gravel and tamp it – remember that every row must be level. You want to do this all the way up your wall; when you are about 3 inches from the top of the wall you can backfill with soil so that the gravel is not seen. 9. Using manufactured blocks and stones are easier when it comes to uniformity and stability. Since no stone is exactly the same, make sure to color match and space out stones that are uneven in color to create a consistent look. You can also use natural stone to build your wall, it might not be as easy to work with but there is such beauty in a creatively designed natural stone wall. 10. Cap blocks will provide your wall with the necessary finishing touch. You can use masonry adhesive to secure the cap blocks to the top row of your wall to hold them in place. This will give your wall a clean finished look – much like adding edging to a garden bed or paver patio. Installing a retaining wall can allow you to organize your garden areas in the most elegant way. A well-designed retaining wall can completely transform your property and a well-constructed one can stand the test of time. Following these pointers will allow you to design and construct a retaining wall that has both stability and beauty. Almost everyone can appreciate a well-designed landscape but chances are that most of them believe that landscape design is merely putting plants in the ground. Truth is, landscape design is so much more than it appears to be. As landscape designers it is our duty to explain to you what exactly landscape design is and what it entails. Landscape design is an art form; it is where nature, culture and vision are combined to transform a property into a functional, creative and beautiful outdoor space. To put it simply, landscape design is the practice of putting together a plan that best utilizes an outdoor space in the most beautiful way. Designing a property takes time, energy, imagination, creativity and lots and lots of planning. Landscape design is broken down into two categories: softscapes and hardscapes. Softscapes encompasses all of the plant materials used in the landscape whereas hardscaping pertains to the stonework that is implemented into the design (such as rock walls, walkways, patios and more). There are 4 main principles when it comes to landscape design: proportion, order, repetition and unity. Proportion refers to the size of an object in relation to others in the landscape – this is more commonly used when implementing hardscapes into the design. Orders refer mainly to organization and balance in the landscape; this is very important when designing a space with plant materials. Repetition is used to create a familiar pattern and feel to the landscape – a landscape designer will repeat the use of certain plant materials or elements throughout the design. The last principle is unity; this refers to the flow of the landscape. Landscape designers want to ensure that all materials used in the project work together to create a theme, style or specific atmosphere that best reflects the clients’ personality and vision. Landscape designers are professionally trained to apply their extensive knowledge of space theory, design principles and the “right plant, right place” concept to best utilize any outdoor space. “Right plant, right place” refers to choosing the correct plant material for the specific site conditions. Soil conditions, amount of sunlight, drainage conditions, wildlife and watering practices are just some of the things that are taken into consideration when selecting the plant material for a project. Landscape designers have an extensive horticultural knowledge base, making them the “go-to” plant experts. Where a plant should be placed, how it should be maintained and how to manage pests and diseases are only a few of the questions professional landscape designers can easily answer. Aside from the aesthetics and horticultural knowledge – to ensure the functionality of the design, a landscape designer will take into account the spaces that are used, the clients’ lifestyle and the constantly changing needs of the clients’ home. A landscape designer will use their knowledge and ideas to help a client realize factors that they might not have considered previously. Each project is overseen by the designer, from the initial consultation to the completion of the project – they want to ensure that the completed work exceeds expectation and that the clients’ dream landscape has become a reality. When designing an outdoor space, designers take into consideration the clients’ budget and vision, site conditions, amount of usable space and the use of appropriate plants and other materials. Most people rush straight into the installation and construction phase of an outdoor design, without taking these important factors into account. This leads to a project that costs more than what they wanted to spend, more work than they wanted to do and a project that most likely will provide a less than acceptable end result. This is why hiring a professional designer comes in handy; they take all aspects of the job site into account to design and install a breathtaking one-of-a-kind creation. In a time and cost effective manner, landscape designers can transform an ordinary outdoor area into an extraordinary work of art that can last for many seasons to come. Hardscaping has become increasingly popular over the years as people are now starting to realize more the value detailed stonework adds to your home and your lifestyle. Adding stone pavers to your landscape is a home improvement project that will better the aesthetics of your property, improve your curb appeal and increase your overall property value. From an elegantly detailed stone patio in the backyard to a simple walkway to your front entrance, implementing stone pavers into your landscape design can add structure, charm and so much more to your property. Using stone pavers in your landscape design is a great way to add detail and character to your property; it will allow you to transform the exterior of your home into a work of art. You can use a high quality material to create an outdoor stone patio and turn your backyard into your own private oasis. You can use stone pavers to create walkways throughout your property or to frame and highlight your garden areas. When an appraiser comes to look at a property, one of the first things they look at is the design and overall quality of the landscape – having stone pavers implemented in your outdoor design will help your landscape better reflect your personality and your lifestyle while increasing your property value at the same time. While adding elegance and charm to your property, installing stone paver walkways creates organized paths throughout your property. Having a beautifully designed walkway will also allow you to maneuver safely throughout your property. By creating a permeable walkway surface, you will significantly reduce the amount of standing water throughout your yard. The water will flow though the base of the pavers to the ground below providing a less slick pathway and a better route for the water to drain from your property. The first thing a potential homebuyer is going to notice when they pull up to your property is its’ curb appeal. Adding stone pavers into your outdoor design is a surefire way to significantly enhance your homes curb appeal. Using stone pavers in the landscape can allow you to highlight and give definition to your garden areas or make your entry way more enticing and more welcoming to your friends and family. Implementing a hardscape design in your landscape can completely transform the feel and look of your property in all the right ways. When it rains, the flat areas throughout your property turn into mini ponds and large driveways can create major runoff issues. With stone pavers installed on your property, the water will be directed and controlled, reducing the risk of standing water and potential flooding. When stone pavers are properly installed, the ground is pitched away from the house and surrounding garden beds; by directing the water away from the foundation of the property you are avoiding any potential damage rising waters could cause. The installation of stone pavers, whether in a patio or in a walkway, is a wonderful and affordable way to increase you’re the charm, value and safety of your property. The exterior of your home is just as important as the interior and should reflect the same elegance and personality as such. When the reasons we just discussed are taken into consideration, its funny that such a small home improvement project could make that much of a difference; the end result will be a landscape you, your friends and your family can enjoy for years to come. Hardscaping has become increasingly popular as of late and the trends in hardscape design have shown to be primarily centered on outdoor entertainment. Homeowners are paying more attention to architectural details and materials when designing their outdoor space. Natural stone textures, eye-catching patterns and unique designs are being seen a lot more as homeowners want the exterior of their home to reflect the same atmosphere and functionality as the interior. Let’s discuss some of the current trending details in the hardscape world. It’s no wonder that fire pits are one of the top “must-haves” in any outdoor space. However, it is not just a simple fire pit design that is taking the hardscape world by storm. Homeowners are learning that built-in benches, seat walls and ledges made of natural stone, all surrounding a fire pit, do indeed make the space more elegant and more inviting than the fire pit alone. The popularity of this design displays the developing trend of multi-level seating as well as eclectic paver choices and designs. Outdoor kitchens also continue to grow in popularity especially with the technological advances in audio-visual equipment and Wi-Fi accessibility as well as a growing interest in sophisticated lighting. Another trend within outdoor kitchens is the desire for multiple cooking surfaces; homeowners now want their outdoor eating area to more than just a grill. Gas burners, convection ovens and brick ovens are now almost seen as a necessity when designing an outdoor kitchen. Aside from an outdoor cooking space, outdoor living rooms are also becoming a standard in new construction especially for the design of higher end homes. One of the newer trends in outdoor living rooms is the faux rug paver design. Homeowners are now turning their backyards into literal extensions of their home – the concept of “bringing the indoors out” is beginning to prove to be one of the more popular home improvement projects. Water features have always been a statement piece in a outdoor space, from ponds to fountains to man-made streams – they are showing a large increase in residential popularity as of late. With the shape the environment is in today, homeowners everywhere are looking for more ways to “go green”. Thus creating the new trend of permeable pavers. These pavers improve the quality and reduce the quantity of storm water runoff. With a cistern and a pump, the water that filters through the pavers can be collected and recycled for irrigation. Commercial and large residential developers have also found that with these pavers there is no need for a retention pond, thus increasing the amount of usable space. Years ago, when you thought of an outdoor space it consisted of maybe a pool and a grill. Slowly but surely times are changing and homeowners are now taking full advantage of the advances in design techniques, outdoor appliances and hardscape materials. A backyard has become so much more than what it used to be. Now you are able to design, create and totally enjoy your own oasis outdoors with every comfort of the indoors. There is no better way to spend a warm summer night than dining with friends and family on a beautiful stone patio, surrounded by the delicious smells of a home-cooked meal. Having an outdoor kitchen will let you do just that! Of course, you might ask, “Why spend the money on an outdoor kitchen?” The answer: An outdoor kitchen is a great investment, and one you will enjoy for many years to come. The first (and most popular) reason for adding an outdoor kitchen is that it instantly converts a ho-hum backyard space into a breath-taking cooking and entertainment center. Imagine what it would be like to mingle with guests outdoors while dinner is on the grill, the sides are simmering on the stovetop, there’s more than enough space to move around, and the cook won’t have to miss out on all the fun! 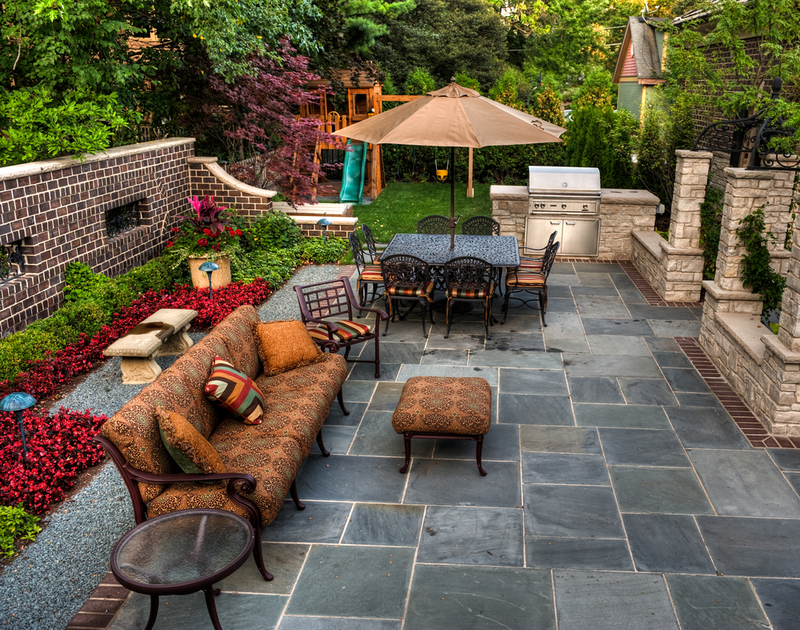 Also, did you know that an outdoor kitchen could increase your property’s value? Experts agree that a homeowner who installs an outdoor kitchen can expect a return on investment from a low of 70% to a high of almost 200% percent. And that makes sense. Stainless steel grills and other modern outdoor appliances are easy to clean, and able to withstand the changing outdoor temperatures. So, your new kitchen will serve you well for many years and add to your property’s value, if—and when—you decide to sell. Often, the first thing that comes to mind when considering an addition is the disruption (and mess) that comes with construction. For an outdoor kitchen, the transformation takes place, well, outdoors. Building an outdoor kitchen gives you that desired extra living space by using the room you already have on your back patio. Outdoor kitchens can lead to quicker cleanups and healthier lifestyles. Strong cooking odors will no longer fill your home, and grilling beats frying any day because there’s no batter coating or dripping grease. Everyone likes to save money, right? 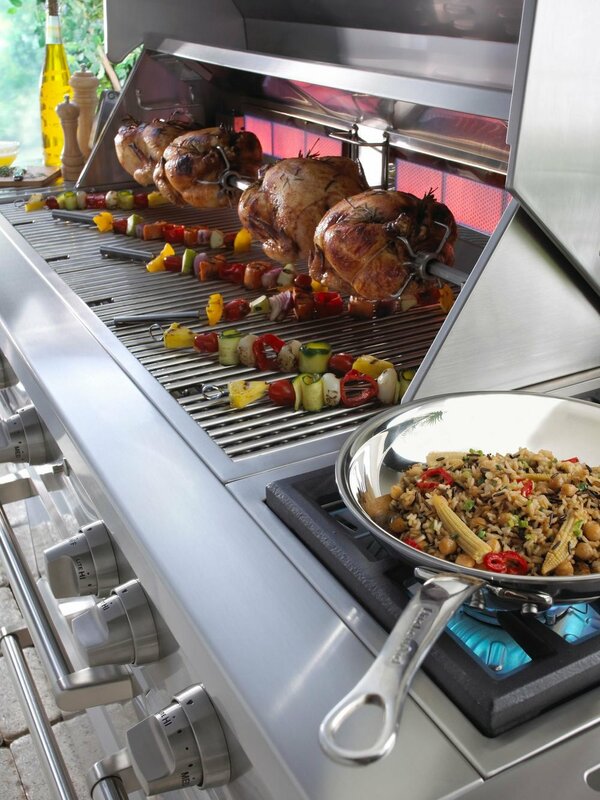 Well, did you know that an outdoor kitchen may help you cut your utilities bills? When you cook up a storm inside, the temperature rises, causing air conditioning to work harder than it should. Cooking outdoors will help you save on energy consumption. Want to hold on to even more money? Having your own outdoor oasis may slash your restaurant budget, too; you can enjoy a “night out” experience in your own backyard and keep your wallet in your pocket. When you consider the decision to build an outdoor kitchen, it’s clear to see that the pros greatly outweigh the cons. Building an outdoor kitchen truly is an investment and will prove to be more rewarding than costly. The design can be customized to your budget and your needs. When your project is completed, you can sit back, relax, and congratulate yourself on a decision well made.